Volleyball techniques for learning how to play volleyball. The fore-arm pass is for receiving hard-driven serves and spikes. You need to be able to forearm pass because this technique allows you to gain control of the ball and pass it accurately to the setter to generate an offensive attack. Stand with feet slightly wider than shoulder width. Knees are bent and weight is shifted forward. You want to be leaning forward and in a comfortable position ready to move in any direction. Weight is on the balls of the feet, with arms relaxed and extended in front of the body. Hands are together in a position that ensures a flat surface with the forearms. The angle of your platform will determine the trajectory of the passed ball. A higher platform passes the ball up. A lower platform passes the ball more straight forward. Adjust your platform depending on where on the court you're passing from. For example, if you are passing a short serve, you need a higher platform. A bad habit beginning players develop is swinging the arms when passing. When first learning to pass, focus on freezing the platform and moving your feet to get in position to pass. If you don't move well to get in position, this is when players reach and swing the arms to try and make the play. The overhead pass may be used to play any ball that is moving high and slow, to set up an attack, or to keep the ball in play when an attack isn't possible. You should use the overhead pass at appropriate times. For example, use the overhead pass when the ball is higher than shoulder level and coming with little force. If the ball is going to be a free ball, this would be a good time to take it overhead. Receiving serve isn't usually a good time because the ball is coming much faster and it's harder to get in ready position to pass. Begin standing with feet shoulder width apart, the right foot slightly ahead of the left. The knees should be bent slightly, and the weight should be on the balls of the feet. In this semi-crouched position, the player will raise and cup her hands above the forehead, waiting for the ball. When making contact, be sure the shoulders are square to the target. Play the ball with our fingers, not palms, and push through using arms and legs, not wrists. If you have developed your serving skills, you will give your team a big advantage. Serving is a very important skill in volleyball. A good server can boost your teams momentum. There are different types of serves such as floater, topspin, roundhouse, and jump serve. 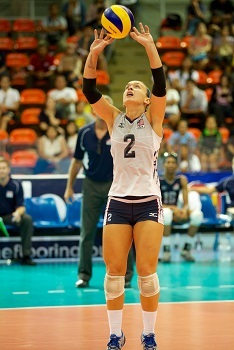 The overhand floater is the most common type of serve. Learning the overhand serve can be challenging at first because of how important an accurate toss is. A consistent toss along with with coordination, strength, and timing will help you learn this skill. A ball that's tossed to far in front, behind, or too low will cause the server to make an error. Focus on always tossing the ball in front of the hitting shoulder. Stand with feet in stride position. As you toss the ball, bring your hitting arm back with elbow high and hand close to your ear. Swing your arm forward keeping your eye on the ball. Contact the center of the ball with the heel to middle area of your open hand. To get the ball to float, focus on contacting the ball in a way the makes it not spin. Digging is similar to forearm passing. Digging is different in that the player has less time to react to the ball. When digging, the player should allow it to drop as low as possible. This increases the time the player has to make the play. When playing the ball, cushion the ball in a way that absorbs the force of the hard-driven spike. The ball should be passed high enough for the setter to get to it. As a defensive player, you should know where your setter is and how skilled your setter is because you need to pass the ball in a way that makes it easiest for your setter to set. This is the main job of a defensive player - make the setters job easier. Perhaps the most fun skill in volleyball is spiking. Once your team has developed skills to pass, set, and hit, you'll enjoy the excitement that great teams generate. The attacker (spiker) should stand in a relaxed position with arms comfortable at the sides. Stand about 8 to 12 feet off the net, ready to be set. The volleyball approach is one of the most fun athletic movements in volleyball. The four-step movement is the most common approach used. For right-handed players, go right-left-right-left. For left-handed players, go left-right-left-right. From steps two to three need to be quick and explosive. As you start your approach, swing your arms back in a relaxed manner then bring them forward as you're taking your last steps. Your arms should come forward in rythm with your jump. When contacting the ball, your hand should be firm and hard. Get your hand on top of the ball, striking the ball in the center. You want to focus on making the ball have topspin. Reach high, contact the ball high forcing the ball to have topspin. It's usually best to focus on backwards shaping when teaching volleyball techniques, especially for spiking. First focus on ball contact. Have players stand on a platform at the net and focus on good contacts. Next, focus on footwork. Work on mastering the approach. Get players comfortable with taking the steps. Use a device such as a spike trainer. A spike trainer is a device that holds a ball at a certain height. This is important because you can force players to reach high every time they approach. Get them in the habit of reaching high and getting comfortable with what that feels like. The last thing to work on is spiking off a set. This is where you bring all the pieces together. If your contact is good, your approach is consistent, you reach high when you contact...now you've got to hit off a real set. This can take a while to get good at because of learning the skill of timing and adjusting to the set.